If even half the legends passed down through generations are true, the Old West was a riotous and exciting place. Whether heroes or desperadoes, these legendary people all seem to have either been born in, traveled through, or fought for the great Republic of Texas. Many books have been written, movies made, and cities named after these men. But they didn't fight, shoot, and rustle all the time. They needed rest. They needed relaxation. They needed love. And Fannie Porter of San Antonio supplied these diversions. This is her story. The Fannie Porter who tantalized men was a voluptuous, pink-cheeked widow with flashing brown eyes and a pile of burnished brown hair piled high on her head. She stood straight, like a dancer, and wore beautiful brocaded clothes that showed off the tiny waist she was so proud of. She must have spent quite some time turning this way and that in front of her looking glass to be sure everything was perfect before descending the opulent staircase leading down to the front parlor of her, what was it they called it? Oh yes, "boarding house." Fannie and her family had emigrated to Texas from England in 1874 when she was only a year old. Just 14 years later, she began her professional life as a fallen angel in San Antonio and earned her later reputation as a formidable, shrewd businesswoman before she was out of her teens. It was at the tender age of 19, an age at which other young women found themselves teaching school, nursing the sick, or married off, that Fannie utilized everything she had learned and started her own brothel. One day, it would make her a rich woman. Fannie, whose appearance was always immaculate, supplied more than just pretty girls with whom men desirous of companionship might choose to wile away the hours in a pleasant diversion from hunting, shoot outs, and Injun fighting. One of the niceties she supplied was rare to sporting houses in those days for Fannie's girls were free of diseases. This made her establishment as safe to visit as a convent, and a lot more fun. Fannie's brothel was visited by both outlaws and lawmen because of her warm personality, the fact that she chose five to eight extremely attractive young girls between the ages of 18 and 25, and her requirement that the girls practice good hygiene. At the time of the 1900 U.S. Census, there were five ladies of the night living full time in Fannie's "boarding house." Fannie herself was mentioned off and on in various San Antonio city directories from 1880 until 1902. By 1895, her house was one of the most popular in the Old West. By that time, it had become a frequent stopover for outlaws evading capture and Fannie was vastly admired for her discretion. She emphatically refused to divulge the whereabouts of any wanted man to the authorities no matter how much pressure was brought to bear. Fannie knew well the meaning of the word "honor," unlike today's madams who will sell names from their little black book to the highest bidder. Not Fannie. She remained mum. Other reasons patrons enjoyed Fannie's establishment were the elegant imported brass cuspidors, classy upholstered furnishings and luxurious appointments. For some "special customers," she reserved bottles of chilled champagne. That included members of the Wild Bunch. 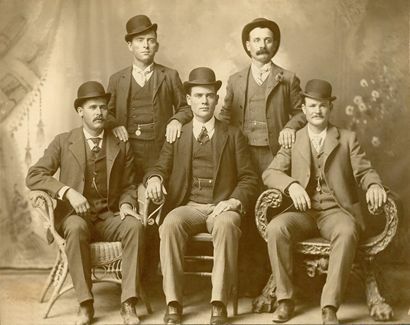 Front row left to right: Harry A. Longbaugh, alias the Sundance Kid, Ben Kilpatrick, alias the Tall Texan, Robert Leroy Parker, alias Butch Cassidy; Standing: Will Carver & Harvey Logan, alias Kid Curry; Fort Worth, Texas, 1901. Not one to discriminate, Fannie's patrons also included certain lawmen and she made sure that any lawman who entered received the best treatment. As late as 1901, William Pinkerton visited Fanny. He was son of the founder of Pinkerton ("We Never Sleep") National Detective Agency. She was said to have been mighty partial to William Pinkerton because he treated her like a lady. Fannie was well-connected and ran her house generally without interference from the law; however, she was arrested for �vagrancy� in the late 1880s, vagrancy being cop-speak for prostitution. The arrest may have been occasioned by the fact that Fannie chased a police officer from her establishment threatening to knock him senseless with a broom. Built in 1883, the two-storey building at 503 South San Saba* was advertised as a boarding house, but everybody knew that it really was a bawdy house. Primly standing about a block outside of the Red Light District at the southwest corner of Durango and San Saba in San Antonio's Second Ward, Number 503 remained a working witness to the wild and woolly West until after the turn of the 20th Century. Fannie's lavishly appointed sporting house served as hideout, rendezvous, and sometime headquarters for the Wild Bunch and other outlaws for several years. Fannie operated her house with the cooperation of city officials (San Antonio issued licenses to such facilities) and local lawmen. Legend has it that Butch Cassidy made his famous bicycle ride up and down the unpaved street in front of Fannie's place. It is not known if raindrops were falling on his head at the time. Fannie Porter's brothel is often confused with the Fort Worth brothel of a madam named Mary Porter. Despite their identical last name and profession, there is no connection between the two women. Misinformation and the transposition of these two madams' names and cities turns up in some sources, giving rise to the incorrect notion that the Wild Bunch frequented the other Ms. Porter's place in Fort Worth. *NOTE: In 1914, the building was purchased by the Carmelite Sisters of Divine Charity and operated as a day care center. Today, 503 Urban Loop (formerly known as San Saba) is the site of Girls & Boys Town of San Antonio. The original building apparently still exists within the newer structure, according to Sanborn Fire Insurance maps of 1904 and 1956. It was always exciting to hear Fannie say, "There's company in the parlor, girls" because it meant good times, fast living and cash on the dresser. Fannie's bordello beauties loved her for insisting that any customer who mistreated them would be forever barred from her house of good repute, and patrons loved her for the gilded grandness with which she surrounded them. Not only was Fannie's place laden with sparkling candle-lit crystal chandeliers and plush red carpeting, the carved four-poster beds were dressed in imported silk sheets (unlike the girls who were dressed rather sparingly). It is probably safe to assume Fannie insisted all clientele, including members of The Wild Bunch, remove their sharp spurs before climbing into bed, rather than risk snagging even one thread of such expensive silken coverings. One could consider Fannie Porter's the eHarmony of its day, since genuine matchmaking took place at her establishment with regularity, creating quite a turnover of girls. Aside from operating as something of a Wild Bunch dating service, the brothel offered the outlaws a haven where they could relax, party down and unload some of their ill-gotten gains. It was at Fannie's that Harry Longbaugh (the Sundance Kid) met beautiful young Etta Place, as wild and exciting a girl as ever worked at Fannie's. Unless of course the other story is true -- that he met her much earlier in Utah when she was dating Robert Leroy Parker (Butch Cassidy), about which we will soon learn more. Etta Place is probably the most mysterious of all outlaw women. However, Doris Karren Burton, of the Outlaw Trail History Center at the Uintah County Library, ran a series of computer photograph analyses of Etta Place that she published in 1992. The results linked Place to another colorful figure: Ann Bassett, the so-called Queen of the Cattle Rustlers, who dated Butch Cassidy back in Utah. Burton's fascinating research uncovers parallels in their lives too numerous to be coincidental. Based on Burton's findings, together with the findings of Dr. Thomas G. Kyle of the Computer Research Group at Los Alamos National Laboratory, there is no doubt that Etta Place and Ann Bassett were one and the same. 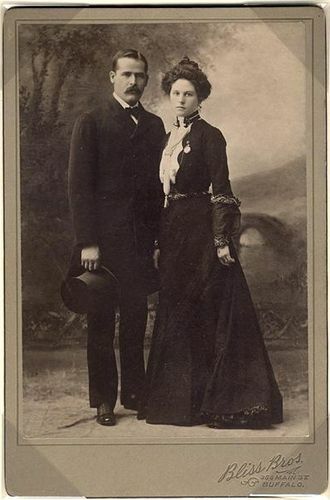 Another match made at Fannie's was that of Harvey (Kid Curry) Logan, considered the most dangerous member of the Wild Bunch, and his girlfriend, the slender Annie Rogers with her high cheekbones and sassy ways. Annie was born Della Moore in Texas, and also went by the alias Maud Williams. It seems women in those days changed names as often as they changed hats. Wild though Kid Curry's reputation was, he was on his best behavior at Fannie's and it has been speculated that he married Annie or at the very least, they posed as man and wife. And then there's Will "News" Carver and Laura Bullion. Will was born in Coryell County, Texas, briefly married to Laura Bullion's aunt, had a romantic involvement with Ann Bassett/Etta Place, and also had a fling with another of Fannie's girls, Lillie Davis, who later claimed to have married him in Fort Worth. But his heart belonged, more or less, to Laura. Laura Bullion was born in Knickerbocker Texas around 1876 and was of German and Native American descent. She used the alias of Della Rose when she was a dance hall girl in Wyoming before working at Fannie's. After Carver died of a posse-fired gunshot wound after a bank robbery, Laura took up with his friend and fellow Wild Bunch member, Ben ("Tall Texan") Kilpatrick. The last time that the Wild Bunch is known to have visited Fannie's brothel was in February, 1901, when they were between robberies, the First National Bank in Winnemucca, Nevada where they got $30,000, and Great Northern Train in Wagner, Montana, which netted the gang $65,000. With the law on their heels, the gang planned to split up and head out in different directions. Before they left for the last time, Fannie threw them a memorable going-away party that must've given them plenty to talk about as they rode off. It wasn't long after this that moral reform became popular and "openly operating" brothels were frowned upon, causing Fanny to gradually fade away together with the Red Light District. Some historians believe that she retired a rich woman, while others believe she married a wealthy man. Subsequent unconfirmed rumors indicated that all went well with Fanny for many years -- until 1940, when she perished in an El Paso auto accident. Life ended for Fanny Porter and she passed into legend like the famous men she protected and accommodated in the house on Durango in San Antonio. James D. Horan, The Wild Bunch (New York: Signet, 1958). Richard F. Selcer, Hell's Half Acre: The Life and Legend of a Red Light District (Fort Worth: Texas Christian University Press, 1991).